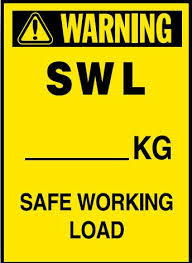 SWL is very important and essential for rigging & hoisting works during construction activities and sometimes stated as the Normal Working Load (NWL). It is the mass or the force a piece of lifting equipment, lifting device or accessory can safely utilize to lift, suspend, or lower a mass without fear of breaking. Usually marked on the equipment by the manufacturer and is often 1/5 of the Minimum Breaking Strength (MBS) although other fractions may be used such as 1/4, 1/6 and 1/10. The SWL is determined by dividing the minimum breaking strength (MBS) of a component by a safety factor assigned to that type and use of equipment. The safety factor generally ranges from 4 to 6 unless a failure of the equipment could pose a risk to life; in that instance the safety factor would be a 10. For example, if a line has an MBS of 1,000 pounds and a safety factor of 5, then the SWL would be 200 pounds. 1000/5 = 200. SWL = 8*D2; in Tons; Where D diameter of rope in inches. Obtained the Breaking strength of the wire rope as per the class. Divided the breaking Strength by Factor of safety.